This is where the techs at Toyota of Renton come in! Not only do we offer regular maintenance services, but also installations and repairs. Drivers near Seattle, WA love bringing their car problems to us––we solve them all! Our certified technicians will gladly perform auto services promptly. 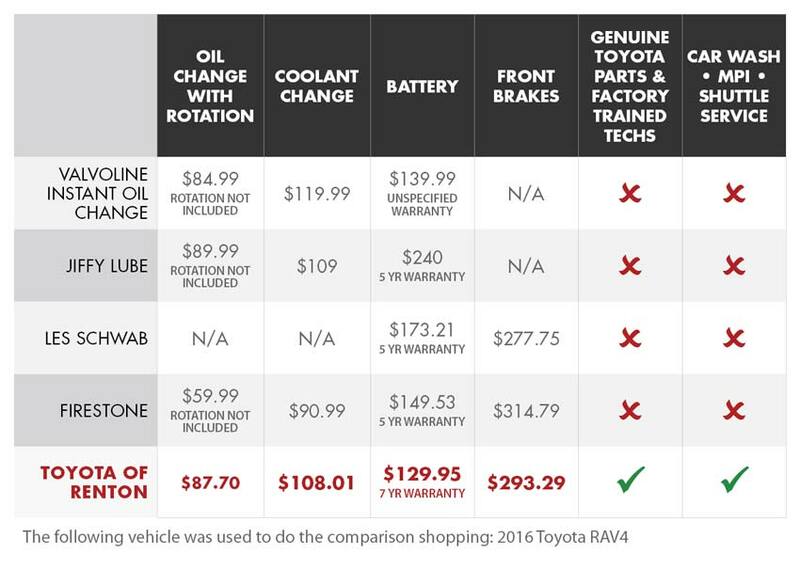 Whether you need a battery or brake repair, the team at Toyota of Renton will gladly assist. Our primary goal is always the same: to get you back on the road with confidence. In case you didn't know, your engine can overheat if it does not get enough oil––which is while oil changes and filter replacements are important. Brake fluid flush services also incredibly necessary, as these keep your stopping system from clogging and causing an accident. A simple routine maintenance every few months can be the difference between you and a $400 tow truck bill (unless you have access to ToyotaCare). The point is, you deserve a vehicle that is always reaching peak performance ratings, so take care of the one you have! Anyone looking for affordable auto care should check out our service and parts specials page. Simply scroll through our available deals and choose the one that seems right to you. Whether it's a new set of tires or an oil change, you'll surely find what you're looking for here. We invite you to schedule service near Seattle, WA now. Keeping up with simple tasks like oil changes will ensure that your car lasts for years to come. The experts here at Toyota of Renton will make sure that your vehicle is serviced efficiently and accurately, so book your appointment today.